Cedric G. Johnson’s “The Panthers Can’t Save Us Now” is a compelling, historically grounded critique of contemporary anti-racist campaigns against police brutality and mass incarceration. While Johnson is encouraged by the swell of organized opposition to the carceral state and to the vigilantism precipitated by the murder of Trayvon Martin, he is pessimistic about the capacity of groups such as Black Lives Matter (BLM) to deliver on comprehensive prison reform. Specifically, Johnson contends that BLM’s insistence on viewing the carceral state through the lens of “black exceptionalism” has produced narrow demands for race-specific remedies to problems—such as police violence, hyper-incarceration, and income inequality— that are rooted in political-economic processes that transcend race. Johnson traces this tendency, in part, to “a prevailing nostalgia for Black Power militancy” that has encouraged “continued pursuit of modes of black ethnic politics.” Identifying the vindicationist bent of recent scholarship on Black Power as a major source of the appeal of disparitarian critiques of hyper-incarceration and inequality, Johnson challenges “black exceptionalism” by detailing the framework’s origins as well as its inadequacies. A staunch opponent of progressive redistributive policies in the United States and around the globe, Zakaria’s neoliberal agenda could not accommodate such historicist interpretations of black life. Instead, “identitarianism” allowed Zakaria to see blacks as noble, long-suffering victims of ontological racism rather than of economic processes, while neoliberalism’s “entitled” white losers were simply getting their comeuppance. BLM’s Vision for Black Lives proposed the kind of egalitarian agenda that is anathema to the likes of Zakaria. Still, according to Johnson, BLM’s embrace of “black exceptionalism” has led activists to understate the impact of issues like automation, the decline of unionization, deregulation, and public sector retrenchment on the plight of blacks and other working people. 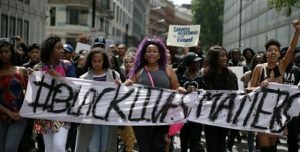 And while the Vision for Black Lives attempted to broaden BLM’s scope, Johnson argues that its commitment to ethnic group politics—which, among other things, presumes that shared racial status can bind black leftists, liberals, and conservatives in common cause—undercuts activists’ capacity to mobilize a broad constituency, motivated by common interest, for either police reform or income equality. Johnson ultimately traces the appeal to contemporary activists of black exceptionalism, in part, to popular conceptions of Black Power, which have failed to take stock of either the movement’s origins or its actual political legacy. Black Power, according to Johnson, reflected a conservative turn in postwar liberal politics. The decline of left-labor militancy during the Cold War combined with a growing spatial divide between working-class whites and poor and working-class African Americans to engender a postwar liberal discourse that—in contrast to New Deal liberalism—uncoupled inequality from political economy. By the 1960s, this tendency would lead Democratic policymakers to devise an inadequate War on Poverty centered on the combination of growth initiatives and race-specific remedies. The Great Society’s War on Poverty on the cheap predictably failed to eliminate the root causes of racial disparities; however, Johnson makes clear that programs like Job Corps, Community Action Program (CAP), Volunteers in Service to America (VISTA), and Model Cities not only nurtured a nascent black professional middle class, but CAP’s “maximum feasible participation” encouraged urban African American activists to embrace a vision of democracy rooted in ethnic pluralism and racial group authenticity. Rustin, Randolph, and Keyserling’s Freedom Budget was not to pass, as neither the War on Poverty nor Black Power could accommodate the type of class-based politics that they and other labor liberals believed was essential to redressing 1960s-era disparities. By the 1970s, however, the political training that War on Poverty initiatives like CAP provided Black Power “radicals” helped usher in the first wave of black elected officials since Reconstruction. According to Johnson, many of the black urban regimes of the 1970s and early 1980s addressed their black constituencies’ concerns about police brutality. But with the War on Drugs, black officials threw in with draconian policing—pressured not just by the federal government, but by black constituencies in high-crime neighborhoods in cities rocked by deindustrialization. In the wake of the 2016 presidential election, the value of Cedric Johnson’s important article is clear. The Clinton campaign successfully used identitarianism to counter a Sanders insurgency that traced disparities to a quarter-century of bipartisan commitment to neoliberalism. Clinton’s efforts to use this tactic to both push back left critics and woo black voters may have been more transparently opportunistic than the Lyndon Johnson administration’s efforts to co-opt Black Power militants; nevertheless, both tactics diverted attention from the political-economic roots of disparities and undercut the prospects for a better politics for disproportionately black and brown poor and working-class people. While some have taken Donald Trump’s successful use of white identity politics, also known as white nationalism, as proof of race’s realness and racism’s permanence, Trump’s cabinet and Supreme Court appointments make clear that his presidency—which will likely usher in a return to Lochner-era labor and regulatory laws—does not bode well for anyone who works for a living. Indeed, even if Trump’s regular vilification of black and brown people ensures that the horrific implications of his presidency are clearest for people of color, his Supreme Court picks will deal major blows to not just antidiscrimination laws and abortion rights, but the right to collective bargaining, protections from employer coercion and caprice, environmental protections, food and drug safety, and more. When read in the full context of the past half-century of American politics, then, the crucial takeaway from Johnson’s trenchant analysis of Black Power-thinking is that when it comes to identity politics, fighting fire with fire only ensures that poor and working people—a grouping that encompasses most people of color—will get burned, while capital warms itself in the glow of victory. Josiah Rector, “Neoliberalism’s Deadly Experiment,” Jacobin, Oct. 16, 2016. Fareed Zakaria, “America’s Self-destructive Whites,” Washington Post, Dec. 31, 2015. Cherrie Bucknor, “Black Workers, Unions, and Inequality,” Center for Economic Policy and Research. Bayard Rustin, “‘Black Power’ and Coalition Politics,” Commentary, Sept. 1966. Touré F. Reed is a professor of twentieth-century U.S. and Afro-American history at Illinois State University. He is the author of Not Alms but Opportunity: The Urban League and the Politics of Racial Uplift, 1910-1950 (UNC Press). Reed is currently working on a book titled Why Liberals Separate Race from Class: The Conservative Implications of Race Reductionism (Verso Books).